Meet SPOT! He was found wandering alone, looking for refuge at the North Omaha Airport in early September. Reports were filed with local animal control, shelters, posts were made, but no one has claimed him. Spot has been making himself at a home with a foster family & is soaking up at all the attention he can get! He is talkative with a sweet meow. He is curious - he immediately explored when they brought him to their house, but didn't seem at all nervous. Then he made himself at home and spent the night sleeping on laps & purring. He is on the larger side, but isn't a giant. Spot really enjoys the company of dogs but isn't so fond of sharing attention with other cats, so he would do best as an only kitty. He also genuinely seems to prefer the company of men. He is amazingly chill and will make someone an awesome pet. He likes to sleep with people at night and will sometimes just pure contentedly to be in the space as you. 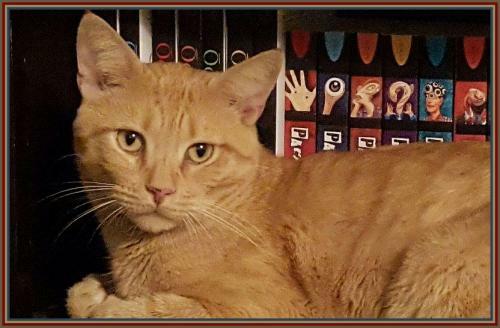 Spot is approx 2 yrs old & weighs 10 lbs, and obviously VERY handsome! We have Spot listed as a courtesy post & will be accepting applications for him then referring them to the foster family who rescued him. 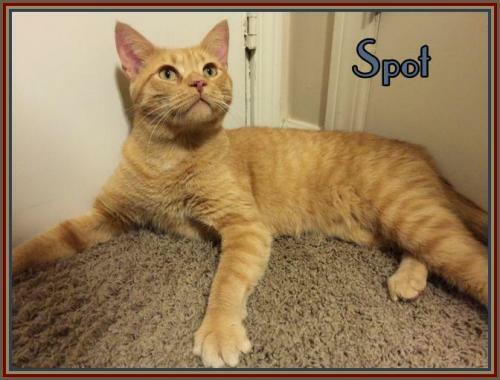 Spot is neutered, vaccinated, tested negative for FIV/FELV. For adoption guidelines and to submit an application, please go to this link. We are a foster-home based rescue group and do not have a facility. The first step is to have you complete our online adoption application. All adoption appointments are scheduled after your application has been approved. We are 100% volunteers & will generally reply within 3 days of application submission. PLEASE be sure to answer all questions completely or it will delay processing, be sure to include vet phone#. If you have any questions please email DollysLegacy@aol.com. Please 'LIKE' our facebook page to learn more about our rescue, see more pictures & get updates on all our adoptable pets!